Toronto’s famed CN Tower is enjoying a spectacular case of double vision. The landmark attraction – which last year hosted a record 1.9 million visitors – on Tuesday unveiled upgrades to its lofty Lookout Level, which included the addition of a glass floor that’s directly above the glass floor on the level immediately below, enabling those safely standing on the specially designed upper glass to look through two sheer levels of flooring and see the streets of Toronto nearly 1,150 feet below. Those standing immediately below the new glass addition and looking directly up will only see their reflection. Each of the glass footings measure around 200 square feet, with the upper one providing a slightly more expansive view, thanks to technological advances that meant it needed less structural support. The CN Tower, which dates back to 1976 (the first glass floor was installed in 1994), remains the tallest structure in the country, dominating Toronto’s towering skyline. “We’re always looking for ways to enhance the experience,” Joanne Pawlicki, the CN Tower’s director of sales, marketing and communications, told Press Today. Intrepid summertime CN Tower visitors can undertake EdgeWalk, which has harnessed daredevils dangle off the sides of the structure’s uppermost reaches, an experience Pawlicki has herself done and concedes isn’t for the faint of heart. “You’re out in the elements and the wind is in your face,” she noted of EdgeWalk. The CN Tower is now the only structure in North America to have two glass floors directly aligned in that manner. Other renovations to the Lookout Level include adding floor-to-ceiling windows throughout much of the level, ensuring all visitors, including those in wheelchairs, can effortlessly see the city far below. The attraction consulted with the likes of the Rick Hansen Foundation to increase accessibility for the disabled. The new open floor design allows “for truly universal access for people of all abilities,” according to tower officials. The renovation includes new food eateries featuring chef-inspired cuisine. A new CN Tower app provides “360-degree panoramic images day and night,” and is available in five languages. Weir praised the “hugely popular” tower for ongoing improvements, among them reducing wait times. The InterContinental Toronto Centre has partnered with the CN Tower, offering a package that provides hotel rooms and tower tickets. “They [immediately] get the ticket and they’re ready to go [up the tower],” Hakim said. Weir added that the area the CN Tower’s in features numerous hotels and entertainment options, among them Ripley’s Aquarium. “There’s only one CN Tower and there’s only one city that has it,” he continued. 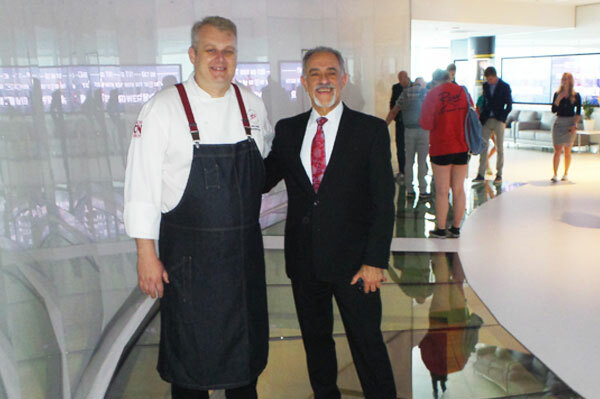 Seen here on the new glass floor are CN Tower executive chef John Morris and Hakim.